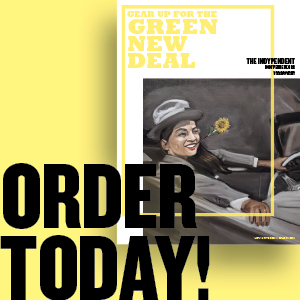 As The Indy’s November issue goes to press, Democrats are on track to gain more than 30 seats and flip the House of Representatives while the Republicans have increased their Senate majority. The split decision garnered most of the headlines in this year’s midterm elections. Compared to the expectations shared by many, it felt like a Blue Splash. Journey further down the ballot, however, and you will find many places where all that canvassing, phone banking, text banking and small-dollar donations made for the Blue Wave hitting hard. New York Republicans have controlled the State Senate almost continuously since the mid-1960s. It is their last bastion of power as the state trends more Democratic and they have made it a place where progressive legislation goes to die. Not any longer. Eight Republican seats were flipped on Nov. 6 and the Democrats turned a one-seat disadvantage into a commanding 39-24 majority, their largest since 1912. The lingering question now is whether Gov. Andrew Cuomo will pit suburban state senators against the city to stymie sweeping rent law reforms, universal health care, better MTA oversight and more. Colorado and Maine Senate and the New Hampshire Senate and House, the Connecticut Senate and the Minnesota Senate. Democrats are now are in full control in New York, Illinois, Colorado, Maine and New Mexico where they hold both the legislature and the governor’s chair. “These ‘laboratories of democracy’ can now begin to forward progressive alternatives on everything from money in politics to climate change, said Robert Borosage, president of the Institute for America’s Future. Alexandria Ocasio-Cortez, 29, officially became the youngest woman ever elected to Congress. Ocasio-Cortez shocked the political world when she knocked off 10-term incumbent Rep. Joe Crowley in their June primary contest. This time she won her Bronx-Queens district with 78 percent of the vote. She will be joined in Congress in January by her fellow democratic socialist Rashida Tlaib who was elected with 84 percent in her Detroit, Michigan district. The only other socialist in Congress is Vermont Senator Bernie Sanders. In 2018, more than 40 members of the Democratic Socialists of America were elected to offices at the federal, state and local level. Rashida Tlaib will be joined by Ilhan Omar as the first two Muslim women elected to Congress. Deb Haaland of New Mexico and Sharice Davids of Kansas became the first two Native American women elected to Congress. 2016 National Teacher of the Year Jahana Hayes of Connecticut and Ayanna Pressley of Massachusetts became the first two Black women to be elected to the House from a New England state. In New York, Leticia James became the first Black woman to be elected the state’s Attorney General. Wisconsin voters finally had enough of Republican Gov. Scott Walker, the two two-term incumbent famous for stripping the collective bargaining rights of the state’s public sector workers in 2011. Despite millions of dollars in backing from the Koch Brothers, Walker lost by one point to Tony Evers, the head of the state’s public school system. Kansas Secretary of State Kris Kobach has been the architect of many of the voter suppression laws that Republican-controlled states have enacted over the past decade. Seeking a promotion, Kobach ran for governor this year on a hard-right platform in normally conservative Kansas but was defeated by Democrat Laura Kelly by 48-43 percent. Kansas schools have been decimated in recent years by Republican tax and budget cuts. With Kobach offering more of the same, Kansas voters decided they had had enough. Conservative red state voters are known for voting against their material interests. However, voters in Nebraska, Idaho and Utah all voted in favor of expanding Medicaid benefits for low-income adults after their Republican-dominated state legislatures refused to do so. Meanwhile, voters in Arkansas and Missouri both overwhelmingly approved minimum wage increases. In Florida, a ballot measure to restore the voting rights of 1.4 million ex-felons was approved with more than 64.5 percent of the vote. In New York’s third-party Olympics, the Working Families Party garnered 106,000 votes with Andrew Cuomo on the ballot line. In doing so, it surpassed the 50,000 vote threshold required to maintain its ballot line status for another four years. The WFP originally backed actor and activist Cynthia Nixon in the Democratic primary before opting to support Cuomo in the general election. The Greens, who refuse to cross endorse major party candidates, also preserved their ballot line with their gubernatorial candidate Howie Hawkins receiving 96,000 votes. 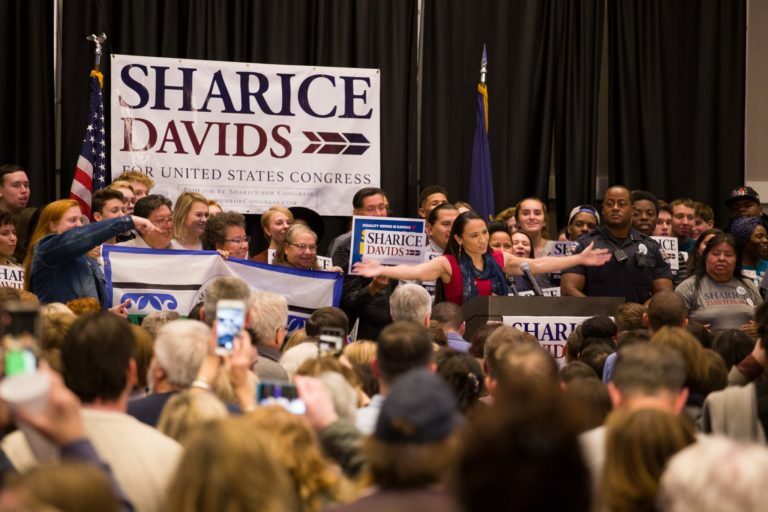 Photo: Sharice Davids of Kansas celebrated with her supporters Tuesday after becoming one of the first two Native American women elected to Congress. Credit: Twitter/@sharicedavids.